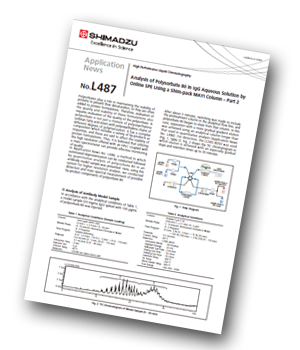 Continued from the previous application (Part 1), Shimadzu has produced an application note demonstrationg how the same online-SPE system using Shim-pack MAYI-ODS was now deployed for the detection of various impurities contained in polysorbate 80 added to IgG solution. Biopharmaceutical products require surfactants to keep proteins stably solubilized, and polysorbate 80 is commonly used for this purpose. 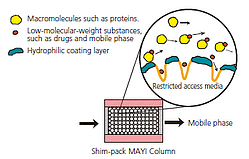 This necessitates not only quantitation but also characterization of polysorbate 80 in the final product. In Part 1 (Application News No. L486), a method in which automated deproteinization can be conducted followed by quantitative analysis of polysorbate 80 in an antibody model sample was presented. Here, using this system for higher resolution analysis, detection and mass spectral measurement of possible by-product components of polysorbate 80 was conducted. In this application, instead of the steep gradient elution used for quantitation of the total polysorbate content, 100-minute gradient was used to fully separate minor components to facilitate structural characterization of the impurities. As a result, seven main components of polysorbate were putatively assigned, including by-product, oxidation product and degradation product.